Modernize is the expert on finding the most reliable contractor if you're needing replacement windows in Bakersfield, CA. We will help you find the perfect contractor to help you with your home window replacement project! We love helping homeowners compare the most trusted local contractors in their area. Find trusted local window installers today! Get free quotes from the best window replacement contractors in Bakersfield, CA, ready to complete your project. When the time comes to replace the windows in your Bakersfield, California home, there is essential information you will need before making a purchase. There are many types of windows , each serving a unique operational purpose in the home. Understanding the basics of window design will help you as you search for the right window replacement. In addition to personal preference and home design, your location in Bakersfield should influence you decision since the ENERGY STAR® requirements vary in different regions of the United States. If you are a homeowner and you live in Bakersfield, this article will provide you with everything you need to know about the basics of window buying, how to pay for your windows, how to meet the permit and license requirements in Bakersfield, and how the climate in Bakersfield should affect your buying decision. Typically, high quality windows have a long life, remaining resistant to weather and extreme temperature changes for years after their installation. However, overtime they will begin to lose their energy efficiency, allowing air and moisture into your home. When a window is no longer performing as it should, it needs to be replaced. First, you will need to understand the difference between buying new construction and replacement windows. Since replacement windows are engineered for an exact fit in the space left behind by an old window, they are only appropriate in projects where there will be no structural changes to the surrounding wall. In comparison, new construction windows have to be directly attached to the frame and studs. These windows are appropriate for new buildings or remodeling projects where the studs are exposed. Second, consider how the window needs to function in your home. If you are looking for a practical, low maintenance window, double hung windows may be the right choice for you. These windows have two vertically hung sashes, one sliding upwards to open, the other downwards. Both sashes can be tilted into the home for easy cleaning of the outside window panes. If you are looking for a single sash window that provides an unobstructed view, casement, hopper, and awning windows all have a single sash and open outwards to allow fresh air into the home. Lastly, you will need to select the design elements for your window frames based on what will fit best in your home. Wood, vinyl, aluminum, and fiberglass of the available options for window frame materials and they are available with various color options. There are also many hardware finishes and glass grid designs to choose from. 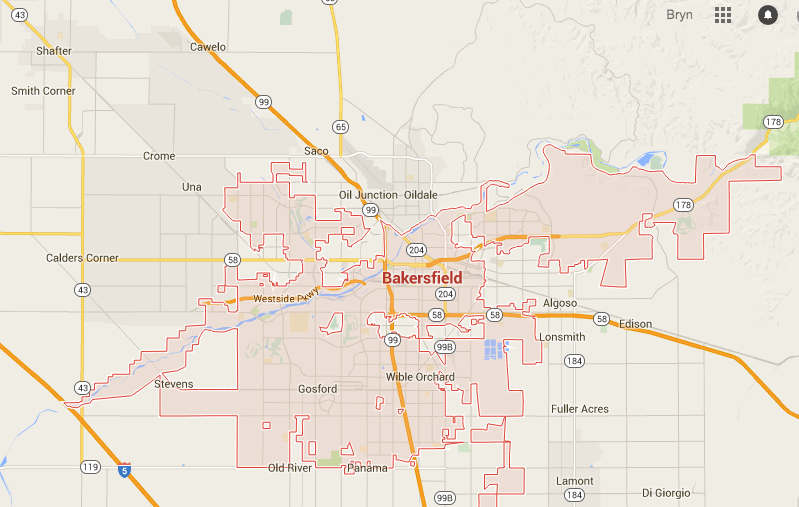 Any contractors working in Bakersfield are required by the city to obtain the proper license and insurance. When contractors will be making major alterations to homes, they must have a general builder’s license. This license can be secured through the Building Division by calling 661-326-3720. Additionally, if a contractor has employees, they will need to carry workers’ compensation insurance, which covers any expenses, including medical bills and missed work, if an employee is hurt while replacing windows in your home. The last thing your contractor needs before replacing the windows in your home is a building permit. Since window replacement is considered to be a major alteration, the city of Bakersfield requires the purchase of a building permit before proceeding. These can be purchased through the Building Division of the city of Bakersfield. Since available tax credits and rebates all expired in 2014, homeowners have to use more conventional methods for paying for their replacement windows. The best way to finance your windows is saving cash to pay in full. If this is not an option, you can also apply for a zero interest credit card or a home equity line of credit. When budgeting for your windows, you can expect to spend between $450 and $600 for vinyl replacement windows and between $800 and $1000 for wood replacement windows. Approximately $50 to $100 should also be budgeted for each window to cover the installation costs. The city of Bakersfield has a mixed climate, located in both the north-central and south-central climate zones as indicated by ENERGY STAR®. Because of this, homeowners living in Bakersfield should expect to use both their heating and cooling systems, depending on the time of the year. Since Bakersfield is located in central California, the city experiences more extreme temperatures than the coastal cities. During the summer the temperatures reaches the high 90s while the winter temperatures drop as low as 39 degrees. The simplest way to find windows appropriately designed for the climate is by understanding the National Fenestration Rating Council (NFRC) label located on each window. This label uses four ratings, the U-Factor, Solar Heat Gain Coefficient, Visible Transmittance, and Air Leakage ratings to communicate the energy efficiency of each window. The amount of heat that can enter or leave the home through the window is represented by the U-Factor. When the U-Factor number is high, that means the window is not very resistant to temperature changes in the environment. Because of this, it is best to have a lower U-Factor rating. ENERGY STAR® requires homeowners in Bakersfield to purchase replacement windows with a U-Factor of 0.30 or less. The amount of solar radiation that passes through a window is represented by the Solar Heat Gain Coefficient. When the temperature outside is cold, solar radiation can assist in keeping the home warm. However, if it is hot outside, solar radiation can overheat the home and increase utility costs. In Bakersfield, ENERGY STAR® requires all replacement windows purchased to have a SHGC of 0.25 or less. The last of the ratings on the National Fenestration Ratings Council label are the Visible Transmittance and Air Leakage ratings. The glass area of the window and the size of the view it provides are represented by the Visible Transmittance rating. Since there are no ENERGY STAR® Visible Transmittance requirements in Bakersfield, this is a decision that can be made solely based on your personal preference. The amount of air allowed to pass through a window is represented by the Air Leakage rating. In Bakersfield, ENERGY STAR® requires all replacement windows purchased to have an Air Leakage rating of 0.30 or less. As a Bakersfield homeowner, it is important to keep in mind how your window purchase can decrease your utility expenses and add to the value of your home. When you follow the requirements outlined by ENERGY STAR®, you can expect to save an estimated $126 on heating and cooling costs. Most importantly, the purchase of energy efficient windows contributes to a more sustainable way of life by reducing your use of nonrenewable energy sources.